Arriving home close to midnight on Sunday, Feb. 27, I was made aware of how blessed (and spoiled) I am to have Paul. He didn’t come home with me, but rather flew to Charlottesville, Virginia, to spend a day with Lisa and return our second car to Bedford (which had been on loan first to Julie during her fall internship in Northern Virginia, and then to Lisa after her car died). It was snowing when I returned, and the 6" of snow in our driveway looked a bit overwhelming when I realized that I was there alone. Paul always shovels and makes sure those things are taken care of. Before taking it on, I checked the weather and found that rain and warmer temps would be arriving through the night, so I pretended it wasn’t there and sloshed through to the house dragging suitcases and mementos from the Princess run. Continuing in the established pattern of touching home base only briefly, I did laundry, repacked, and drove to Glenville, New York (just outside of Albany), to spend a couple of days with my very dear friend Helen Challener, who had just moved into a new home and whose husband was on a 2-week business trip to India. My gamble on not shoveling paid off; I had no problems driving out of our driveway Monday morning, thanks to rain which melted the already fallen snow and ice. Sometimes procrastination is a good thing. My days with Helen passed altogether too quickly as we poked around thrift stores, walked her dog Penny, visited with a wonderful “I want to be like her when I grow up” friend of Helen’s named Betty, and laughed and talked endlessly. It was a total blast and I’m so thankful we were able to shoehorn the visit in between conferences. 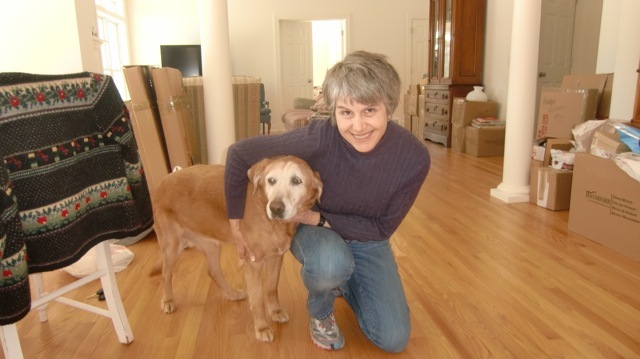 Helen and her dog Penny are getting settled in their new house. 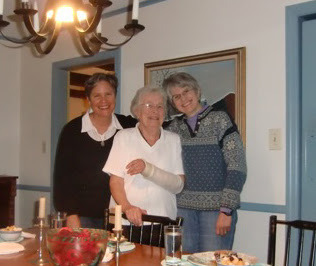 Helen and I spent an inspiring evening with her dear friend, Betty. The following weekend, March 4-6, was our annual H.I.M. 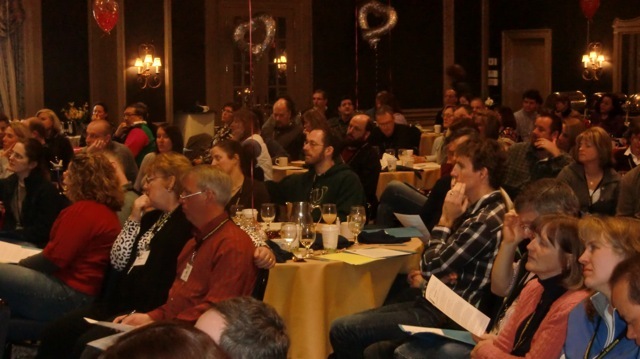 marriage getaway conference. 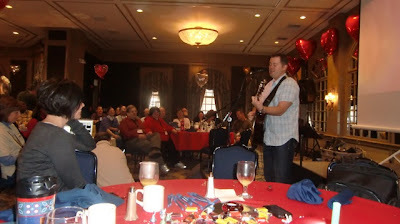 Returning to the beautiful Viking Hotel in Newport, Rhode Island, we had a sell out crowd of 100 couples. At our H.I.M. Board’s insistence, Paul and I spoke for this conference and we felt very, very met by God. We love teaching on the subject of “The Irony of Intimacy” because we’re constantly reminded that at the very heart of intimacy is sacrificial love. It's so easy to forget that in this culture, which is so steeped in entitlement and approved-of selfishness. From start to finish, the weekend exceeded our expectations. We are so blessed to have a phenomenally creative and hard-working team around us. Doug and Julie Macrae knocked it out of the park again with their generous goodie bags and the wonderful decorations, which created an ambience of romance and delight. Jim and Sue Martis handled registrations, the book table, and served as the liaisons for the hotel. They covered every detail masterfully. Guy and Barbara Steele, who are pivotal in every conference, were not with us physically due to a conflict in schedule, but they were with us in “form”: all the forms, handouts, and printed material were once again produced by them. We really missed having them at the conference (it’s the first one they’ve missed in the 7.5 years of H.I.M.’s existence) but were thankful for their partnership behind the scenes. The Tiptons, Musacchios, Ploskers, Hendricks, and Franks also helped in a variety of ways, underscoring the power of teamwork. Did I mention that Paul baked over 200 of his world famous chocolate chip cookies for the conference? Two cookies were nicely packaged and placed in each of the goodie bags. What a guy!!! From the moment our guests arrived and were greeted by a warmly welcoming registration team, to our final prayer Sunday early afternoon, there was a palpable sense of God’s presence and love. 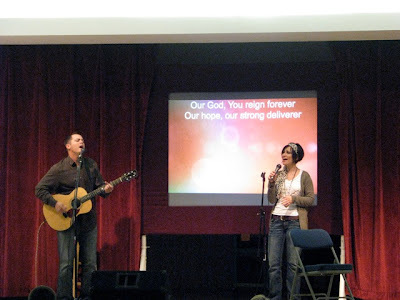 Danny and Rayna Oertli lead vital worship and then blessed us with a fabulous concert Saturday night, which featured many songs from Danny’s new CD which will be released in May. Though they can perform, when they lead worship, they are only about helping us meet God through song. How thankful we are for the humble ways they use their gifts. Workshops were varied and capably taught by a great team of teachers. Many positive comments were expressed on the evaluations about the workshops. The Macraes, as always, spared no expense in creating a welcoming ambience in the meeting room. It was a treat to hear a number of new songs that Danny has just finished recording in Nashville for his next CD. The audience was very, very responsive and engaged all weekend. We couldn’t have asked for a better response to the weekend. God was so faithful to meet us in unbelievable ways. Several have written that their marriage was turned around this weekend. The Body of Christ expanded by at least one, as the long-suffering prayers of a faithful wife were answered when her husband decided to follow Jesus. Wow! That kind of stuff is accomplished not by great decorations or teaching or a well planned conference, but by the Spirit of God and we are humbled by His grace. That night after the conference, North Shore Community Baptist Church hosted a family concert featuring Danny, and about 200 people showed up. Ryan and Kelly Plosker worked hard to pull of this great evening and it was a wonderful night of celebration of all that is good in the body of Christ. It was a fitting exclamation point on the end of an amazing weekend. Danny and Rayna lead worship before performing a concert at North Shore Community Baptist Church on Sunday night, March 6. 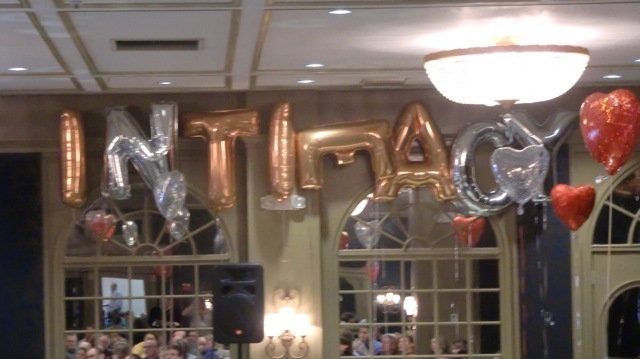 “Putting the Happily Back in to Ever After” was the theme of our (now) annual one-day marriage seminar, hosted by Home Improvement Ministries to serve the greater Boston area. And many of the over 200 people left the day feeling at least a little closer to that desire. Jeff and Shaunti Feldhahn, internationally known for their research data and their publications on the differences between men and women, were well received by the conference attendees. Jeff and Shaunti spoke at three different sessions, giving important and possibly situation-changing information on how to bridge the gap between the genders. Paul and I had invited them to speak after spending a day with Shaunti at the Iron Sharpens Iron Women’s Conference held in Connecticut last fall. Over dinner, Shaunti, Paul, and I talked endlessly together about the passion we share for encouraging marriages. We were so impressed with Shaunti's genuine, down-to-earth self, that we extended the invitation. Since she and Jeff met in Boston, coupled with having never spoken in Boston, they were willing to negotiate with us to make it possible. Though we had really hoped to pack out Calvary Christian Church (our new favorite place for doing conferences because of their great facility and their even greater staff), just over 200 people made it to the conference. We pushed beyond the disappointment of being undersubscribed and watched God work in amazing ways throughout the day. Most who attended were local, but we did have a couple in from Johannesburg, South Africa. Tando and Zama Msoki had been impacted by Shaunti’s books and were able to put together a trip which included running the New York marathon the weekend before. They were a delight! Besides hearing the Feldhahns speak during three sessions, we offered multiple workshops during two sessions. Great feedback was received on the evaluations regarding the variety and quality of the workshops. We are so thankful for the quality team of workshop leaders we had: Ryan and Kelly Plosker, Danny and Rayna Oertli, Tim and Sharon Ponzani, Seth and Melanie Bilazarian, Doug and Julie Macrae, and Eric and Joylynn Mello. All were appreciated! Worship was lead by Danny and Rayna Oertli, which is always a good thing. 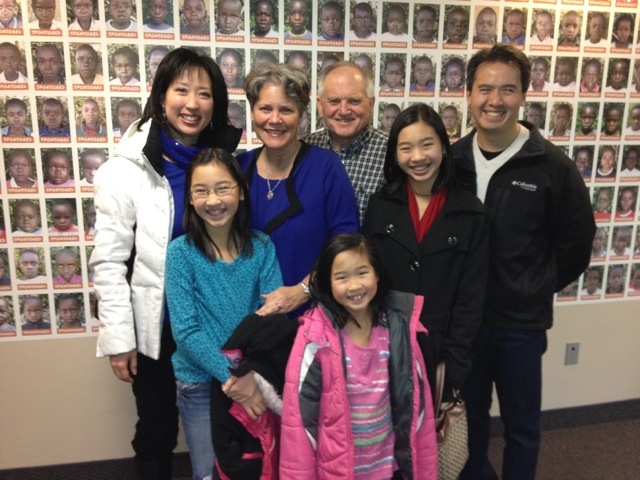 That evening, they did a concert at Calvary Christian Church. Fans, young and old, were blessed by their unusual talent and the sincerity of their hearts for the Lord. Jim Martis of MJM Catering provided lunch, which was delicious and served efficiently. In addition to all day Saturday, we had a “stand-alone” evening on Friday for those who couldn’t attend Saturday. Held at the Peabody Marriott, about 75 came out for the evening and the Feldhahns gave us a sampling of Saturday’s seminar. Tando and Zama Msoki from Johannesburg, South Africa, stand with Jeff and Shauti Felshahn at day’s end. The workshop leaders introduce their topics. Julie Friesen, Derek Johnson, Jeff and Shaunti, and Paul and I send the Feldhahns off. The operations team worked tirelessly all day to make sure everyone was well taken care of. Danny sings a number of new songs off his next CD, which he plans to record this spring. The weeks ahead will be full of counseling, Patriot studies, and speaking. In between, we’ll enjoy the preparation for Christmas and look forward to being with our children and grandson at different points along the way. Happy Thanksgiving for now. It’s good to be reminded that thankful hearts stave off entitlement and discontent. Thanksgiving is really a year-round holiday! We’re thankful for so much...including you.